Instead, the Hackman Scholar arrived that summer in 2017 to spend several weeks before the academic year began working in Assistant Professor of Chemistry Christine Phillips-Piro’s laboratory. Under the direction of patient upperclassmen, Papoutsis participated in F&M’s Moore-Schaefer Mentorship program for gifted chemistry students. She learned firsthand how professor-assisted research progresses, and how to use equipment in Phillips-Piro’s research on protein structure and function. 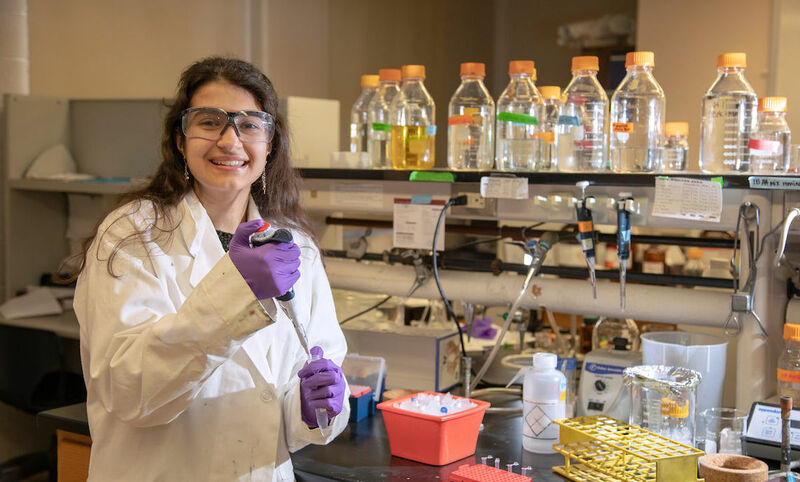 It was the first of several campus research experiences for Papoutsis, a native of Reading, Pa. “Developing the use of doubly-incorporated unnatural amino acids to measure distances in proteins” is the junior chemistry major’s most recent project. Papoutsis measured distances between sites on a particular protein so that their placement on the infrared spectrum could be mapped and used as a shortcut when crystallized proteins are needed. Doing that successfully, she said, could save other researchers considerable time and effort. Papoutsis said she enjoys the sciences, and is focused on a biochemistry track: biology, because that’s a longtime passion, and chemistry because the logical, mathematical nature of the science appeals to her. She opted for a liberal arts college for a purpose. Papoutsis heads back to Phillips-Piro’s lab this summer to conduct more research – and this time, she will be an experienced researcher who ushers in a new cohort of wide-eyed first-year students.